With the passage of the landmark Natural Resource Fund Bill 2018, the Office of Auditor General, will be tasked with auditing Government’s use of the Fund. The Auditor General said that Norway has been sharing key advice on this front with him. He added that his Office has begun sharpening its skills for the oil sector, and in a sense, is already prepared for the audit of the Fund. 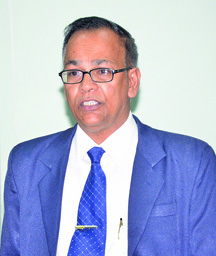 International agencies such as the Natural Resource Governance Institute (NRGI), is of the firm view that the appointment of Guyana’s Audit Office as the External Auditor for the Fund is a wrong move. The Fund made it clear that the Audit Office is subjected to applying for annual funding which is often subjected to cuts, thereby limiting its independence. Considering this and other factors, the Institute had called on the coalition administration to hire an internationally recognized and experienced auditing firm to be the External Auditor of the Natural Resource Fund. NRGI stressed that this move would not be an abnormal one since nations such as Alaska, Chile, North Dakota, Norway, Texas , Timor-Leste and Wyoming each require that an independent external auditor that meets international standards audit their funds. It suggested too, that financing for external audits could be part of the Fund’s annual operating budget. The NRGI said that at this point, Guyana cannot afford to make mistakes or leave anything to chance. It suggested that given the circumstances, Guyana would be placing itself in the best position by appointing an international firm as the external auditor for the fund and not the nation’s Audit Office. During an interview with Kaieteur News on Sunday, Finance Minister, Winston Jordan, said that NRGI would not be the first to make such a recommendation. He said that the Commonwealth Secretariat had suggested same. He noted however that the Secretariat was informed that the nation’s Constitution does not allow for this. He stressed that the Constitution makes it clear that the Auditor General is to be the External Auditor of all public funds. In addition to this, Jordan reminded that the Auditor General will have the financial support he needs, should he decide to hire the help of an international firm for auditing purposes.